You can find this also at the Comp 7 Drive - a passive full-range speaker combined with an integrated active Subwoofer. This combination allows the use of amplifiers with very low output power like e.g. Triode-Tube amplifiers. The amplifier only has to drive the full-range speaker. The oval 6x9" woofer integrated in the speakers bottom plate is driven by the 130W digital amplifier. In current version 2 of the amplifier module we not only did fine tuning on the sound, we also did a completely new implemenation of the user interface. 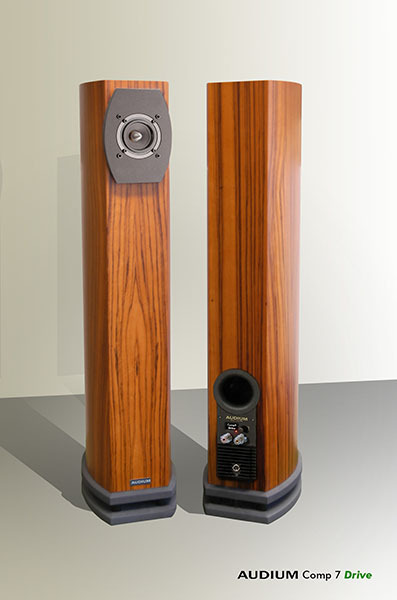 A rotary encoder and a graphics display allow an intuitive adjustment of all speaker parameters. So installation of setup of the speaker is an easy game! The Comp 7 Drive - more then just the sum of it's parts!